Well, I loved Careers Camp so much theat I went back for a second year. Never mind that I had to go get a job just to pay for it, but that's a whole other novel. 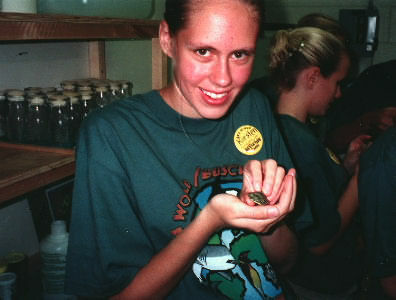 I was just excited to get to go to Advanced Careers Camp this time, with the prospect of even more animal interaction! As before, this page is graphics intensive and might be slow loading. But, enjoy!!! 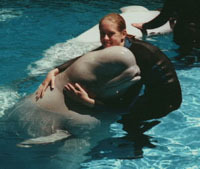 Once again, I got to sit on a plane for several hours, anxiously anticipating a week at SeaWorld. But when I got there, I checked in, dumped off my luggage, and met up with some friends I'd met the year before. We went up to the cafeteria and got pizza. Then we got to go into the park and go on rides and go shopping! I'd forgotten how much the Steel Eel had scared me the first time around! We played a few games in the arcade, too, and I won the Shamu Race game against a full field of campers, and won a big stuffed Shamu! :) I didn't hear the end of that one for awhile... We went back to the dorms, and had the usual introduction and orientation before getting ready for bed. 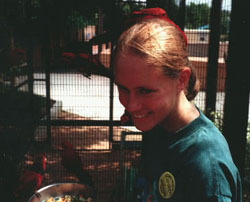 the next day was bird day! We got up and headed for polar, where we were given buckets of fish full of vitamins to feed to the penguins. We had to mark down each bird's number as it took a fish, which is easier said than done! The birds' bands are color-coded, and each color stands for a different number. So you have to read the sequence of colors from the base of the wing outward, then translate that into the numbers. That all wouldn't be so bad, if it weren't for the fact that low lighting makes telling some colors apart from others very difficult! that done, though, we shoveled the requisite snow, and set out food trays for the birds. 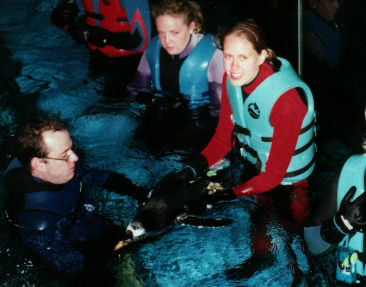 Then came the fun part - we got our wetsuits on and got in the water with the penguins! That water was COLD, only 47 degrees! It was well worth it, though. Several of the penguins were very curious and coming over to check us out. One of them, Mr. Big, was just learning how to swim and wasn't very graceful, so he kind of flopped all over the place and soaked everyone when he came up for air. After lunch, we headed for the bird house. There, we fed a tawny frogmouth (which looks kind of like a little owl) and watched them band a duck. We fed all the birds there, then headed back out to feed the aviary birds, the flamingoes in the African exhibit, and the ducks in the koi pond. We fed the lorikeets again, as well, this time we fed them fruit. They were as noisy and nippy as ever, but I love 'em anyway! ;) We headed back to the dorm and had free time, then dinner at Fuddruckers. There was a huge rain/windstorm while we were there that blew a huge umbrella off a table and blew it away! We went back to the dorms, and since it was rainy we stayed inside and played TV Tuneage. 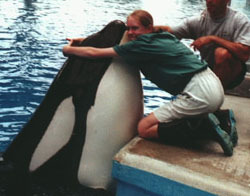 And then it was Kirsten's favorite day - Shamu day!!!!! We got to Shamu Stadium and did a walkthrough and counted respirations, then did breakout and scrubbed down the kitchen. We went outside and watched them weigh the whales. 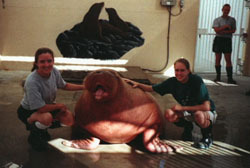 The whales there that year were Haida, Ky, Winnie, and Kayla. 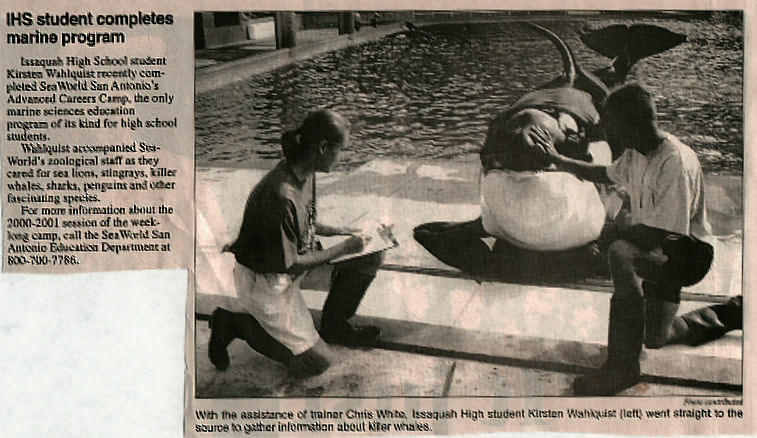 We watched them irrigate Kayla's tooth and take a urine sample from Haida, and I got to be the lucky "carrier of the whale pee." Woohoo! We had a bit of question-and-answer time with the trainers, then we headed to White Whale and Dolphin Stadium. That part was kind of a bummer, because they were putting a huge tarp up over the back areas to give the animals shade, so they weren't working with the animals at all that day. We did, however, get to see the new baby lag, Crissy's daughter, in the main pool, and that's one cute baby! We didn't do the BIP that day, either, that was put off until the last day. But we got into a HUGE guys-vs-girls waterfight, running around the food prep/receiving area/poolside with hoses. Even the trainers ran for cover! We headed over to the dolphins holding and saw Gilly (a bottlenose dolphin, so name because they found the dolphin trapped in a gill net), and Jump, the park's male lag. 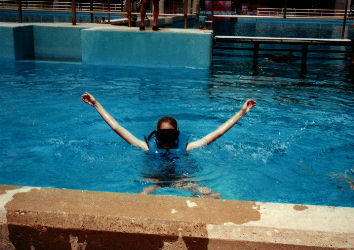 We also went to the Marine Mammal Community Pool for a bit and played with the dolphins there. I gave Mattie a nice, long rubdown, and everyone else was jealous! ;) After lunch, we did afternoon breakout at Shamu Stadium (putting the forzen fish in tubs to thaw overnight), then we headed out to the stage to have our pictures taken with a whale!! I got to give Ky a big hug! Then, we put on life jackets and got to jump into the med pool!! That water was freezing cold! It literally took my breath away as I got in. We swam over to the gate, though, and looked right through the gate at killer whales! They seemed as curious about us as we were about them! We were only allowed to stay in for a couple of minutes, though, cause the trainers didn't want us to freeze to death! Then we got to watch the trainers practice for the show they were putting on that night for a company's picnic. Then, we got the chance to try part of the trainer swim test - climbing the glass. Easier said than done!! Even with a running start it was hard to get to the top! Only a couple of people in our group could do it. My knees were completely covered in dark purple bruises after 45 minutes of trying! We all then went back to the trainers' office, and sat around and talked for about an hour. After heading back to the dorm, we had free time then had Ma's Tacos for dinner. It was pouring rain outside, so we just had free time that night instead of activities. This year, Animal Care was kind of a bummer, but we also got a unique experience as well. We got up as usual and did the massive Animal Care breakout, then went over to the sea lions and fed them all. 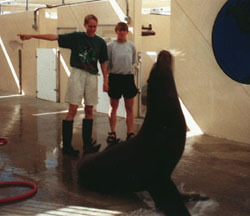 But when we got to the Marine Mammal Community Pool, the tank was drained low to get a blood sample from one of the dolphins. That took all morning, so we watched that for awhile then headed over to the holdpin areas to do the "dunk" where we got in the water and watched the dolphins through the gates! That was pretty cool! After lunch, they got the results back from the blood test and decided to move the dolphin to holding, so we got to watch an animal be transported within the park. We had our group review, then free time, and the scavenger hunt again after dinner. It was the exact same hunt as the year before! We still only came in second, though. Of course, they aways ask for your hometown newspaper's address and have you sign a PR release, but I never thought much of it. Lo and behold, my mom opens the paper one evening, and there's me and Haida! So, when they say they're sending photos and information to your newspaper, they really do!